Installed python-numpy, but Unity Tweak Tool doesn’t open. That too is there, but doesn’t matter. Thanks anyway.I needed UTT only to have the hotcorners, but I have that another way. unity-tweak-tool would have to be reworked to account for no desktop support in gnome/nautilus. Specifically the section System > Desktop Icons which is now useless anyway. ( so it could/should be removed. I hope to refresh-up a bit and perhaps put out a BB 18.04.1 unity-desktop-remix since I still have a license to distribute officially or correct me if i am wrong. Does any one else have a license to distribute unity-remix? 2nd. After I get this done I would try for a 19.04 remix iso. could you paste a list of actions to do for 18.04.1 to set it up for unity desktop. I am using Cubic iso maker. I would suggest that in addition to what’s provided by ubuntu-unity.desktop adding xserver-xorg-input-synaptics package so laptop users get proper settings panel. Additionally inquire as to fixes for the by default broken alt+PrtSc (print window) and re-enabling the use of desktop background in the greeter. Thanks mac3man. Will do. Perhaps I’ll have an iso by tomorrow at my ftp site. I just ran the 19.04 daily gnome3 iso and lo and behold I thought I was looking at unity-desktop. Nice job of gnome3 team to incorporate some of the unity flowcharts. Only thing obviously missing was the unity dash etc . So I’ll try to wrangle out a unity desktop remix with what I have here using cubic and daily 19.04. My new thinking is that if we could put out a more gentle and minimal spin of unity, with the work ability and security that maveric and lucid had, then mabey we can still opt in for official status maybe sooner than later. Let us know if you need any help with the application for official flavor. Something else I would like to propose, just for discussion, is the possibility to relate the Unity 7 project with the Unity 8 project. I mean, to return to the old idea of seeing Unity 8 as the next version of Unity 7. Unity 8 still lacks all the desktop features, but the Unity 8 project presumably will get quite a bit of progress this year. Maybe it is worth opening a new thread for exchanging ideas about this. Official flavor is ubuntu but this thread for unity only. But you can help testing unity (and apps) in disco. We are experiencing some issues with unity itself. I mean, to return to the old idea of seeing Unity 8 as the next version of Unity 7. No. That’s not possible. All the unity8 components have been removed from repo. We are trying to get official status as a desktop but khurshid is right. We are not official flavor. I want to do a build with mini.iso using cubic and than we can perhaps re-apply for official status to the Technical Board. I am open to any help possible to get this done. This would allow faster downloads using ubuntu servers and testing etc. It appears that no compiz plugin button setting can be changed, enabled, edited, ect. in ccsm for any plugin. The only thing can can be done is if enabled by default they’ll be disabled. If set by other means they all work, but as is there’s no way to set anymore. Simple example, ccsm > Expo > try to set Expo Button, can not be set. Fixed media keys in disco. You can try installing unity-settings-daemon from the ppa. and re-enabling the use of desktop background in the greeter. Install patched caja and u-s-d and ucc from ppa. Test if this working properly for you. Creating a patch for UTT. But I did not get nod from caja or unity team either. The settings-daemon immediately, control panel on use. Both show same apport title, ’ signal5 in g_ object_new_valist(), both same terminal output, " GLib-GIO-ERROR **: 03:49:02.970: Settings schema ‘org.mate.background’ is not installed"
Yes in the ppa I am testing with caja. So you need to install mate-desktop and caja. And I am uploading a new version with correct dependency. Update: I have uploaded caja, u-c-c and u-s-d in the ppa now. I see a couple of minor issues. (fresh updated install, ppa added, upgraded, caja installed. I guess caja becomes new default file manager for folders on Desktop?, don’t think that matters much either way. As far as anything else during use will have to use a bit. As a comparison to caja handling the Desktop set up a ppa with nemo to do that. Best compared on a separate install to one with caja setup as above. After adding ppa, install nemo, log out or reboot. Nemo will automatically take over handling Desktop 2 sec after logging in. 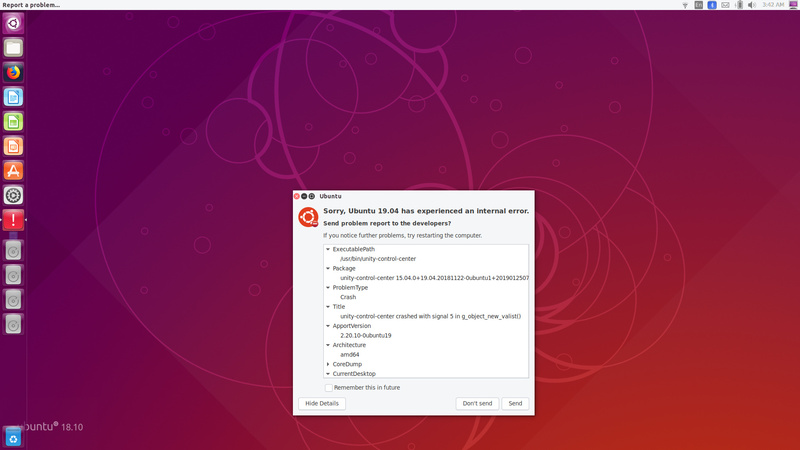 (- I also notice that unity-greeter is showing Desktop background, did the fix make it into Ubuntu repos? Note that ppa is just for compare, will not be maintained. The compiz there is just for quicklists in nemo, prevents busy cursor syndrome.